Michael Parris wasn't trying to start a revolution when he turned Igneous into the first full-time custom ski shop in '98. He just wanted to make skiing more fun. Screen grab photo. We’ve all heard the story: A promising academic moves to a ski town and never leaves. He or she becomes really good at skiing or snowboarding, acquires a rescue dog, and perhaps gets a great job at the airport. Their fancy Harvard degree goes unused for years and they usually end up trapped in mountain town Neverland into their mid-thirties. This is what happened to an architect major and robotics engineer from Carnegie Melon University named Michael Parris back in 1998. But instead of becoming a plain old ski bum, he used that higher education to help start the first-ever custom ski company: Igneous Skis. Since then, Igneous has been steadily chugging along in a small shop Jackson, Wyoming. The shop produces about 80 pairs of skis and 20 snowboards a year—each one starting at $1,600—but every product is custom designed and meticulously crafted by Parris himself. Parris believes that by continuing to experiment with shapes, sizes, materials, and building methods, he can have a positive influence the entire industry. Parris’s friend, Adam Sherman, started Igneous Skis in 1993. Parris would help Sherman out anytime he came to Jackson to visit but didn’t start full-time until five years later. Parris became a partner in 2000 and took over the business in 2007. We recently sat down with Parris at his shop, to ask him about why he has dedicated his life to this craft. Check out his answers below. When my friend Adam moved here in the early ‘90s, he was a little dissatisfied with the current offerings of the ski industry. The options were all the same and the skis didn’t last riding the lines at Jackson Hole Mountain Resort. You’d hit rocks and crack your edges, blow out your sidewalls, bend your skis. He decided around ‘93 that he was going to try and make a better ski. I was friends with him at the time and encouraged him to do it but I was still in college so I was going back-and-forth from here to Pittsburgh. I would come out here on my Christmas breaks and Spring breaks to check up on him and egg him on. And in the summer of 1998 I came out here to go climbing and I helped him build a ski press. Ultimately, Iended up staying. That’s about when we started making shorter, fatter skis. I had a background in snowboarding and the idea was to make skis that could float like snowboards. Skis that could ride the terrain down the mountain instead of hop turning down the fall line. What did you do before Igneous? I was going to school for architecture and I worked for the Carnegie Melon University doing mechanical design for lunar rover prototypes. 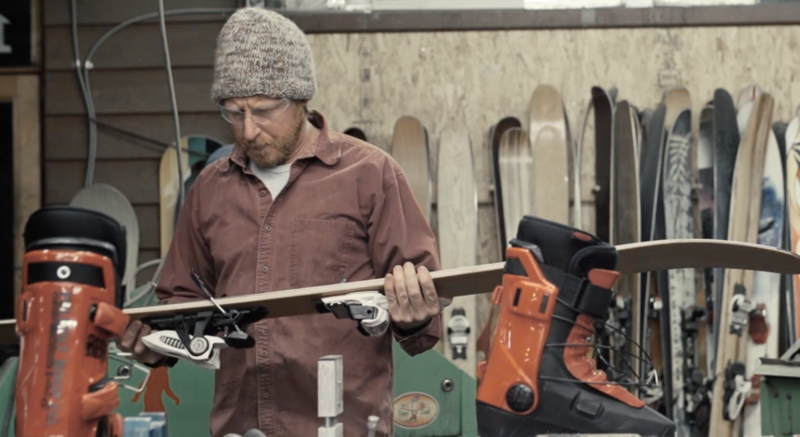 Did you ever imagine you’d be living in Jackson Hole making skis? I never imaged I’d be doing this but I’ve always wondered how skis were made. My dad was a carpenter so I grew up making things and working with my hands. Even throughout architecture school I would make things like wood furniture. I would tinker in the wood shop to learn how to weld and cut wood. So I’ve always been interested in building and designing things and I have been skiing and snowboarding since I was a little kid. I fell into it but it was a good fit. I grew up in Altoona, Pennsylvania, and skied a resort called Blue Knob. My buddy Bill and I were ski patrollers. We worked as full-time patrollers when we were in tenth grade. Every day after school we’d try to have our boots on by 3:30 so we could get a run in before we patrolled night skiing. Where was Igneous’ first shop? We started in a couple garages. Adam and his buddies rented a house over on Maple Way in town and that garage is where we’d cut parts. And our friend Gordy owned a place in Cottonwood and he rewired his electrical system so we could hook up a ski press in his garage. We moved into this shop in summer of ‘96. So we have been here for almost 22 years now. Describe your method for creating skis. The process starts with a discussion with the client. We talk about how and where and why they ski, what terrain and conditions they like, what skis they have had in the past, their experience skiing, how many days they ride, their boots and binding and their history, where they are now, and where they want to go with it. Someone has probably said skiing isn't rocket science, but it doesn't hurt to have the mind of a rocket scientist designing your planks. Screen grab photo. From there, we get into the construction. We build our own cores—we use hard maple and white ash for resort skis. The maple is lively and responsive; the ash has similar flex but has vibration absorption properties. They work together, similar to making an alloy out of two metals—you get properties you like out of both. For touring skis we use maple and Douglas fir. It makes for slightly softer flexing but substantially lighter weight. Then, the shaping and profiling of the core to make the flex pattern and overall stiffness which is determined by someone’s weight, height and speed they typically ride at. The next step is the fiberglass weight or carbon fiber lamination. We use sandwich construction so you have a sandwich of core in the middle of two layers of either glass or carbon. The glass or carbon provides the torsional stiffness of the ski. So the different weights of soft glass we use affect how the ski performs. Say a racing ski—you want it to be rigid torsional so it’s precise when you roll it over. But that can be a demanding ski to ride in cut-up snow or crud. Then on a powder ski we use a light type of glass to allow for torsional play in the ski so you can deflect and twist to ease into turns. It steers at lower speeds and is more forgiving. For topsheets, we use hardwood veneer topsheets. We cut some of the domestic woods like maple and ash here. We pull out the boards with more interesting grain patterns and slice them up for the topsheets. Then we also get exotic veneers from all over the world. 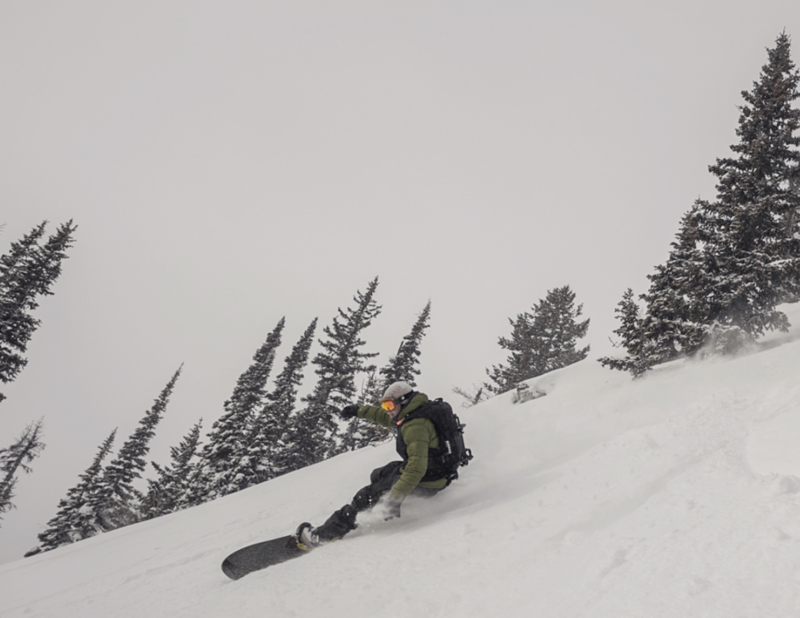 Igneous doesn't just craft planks; their snowboard designs are handcrafted with love and devotion as well. Igneous photo. We did it, then we rode the ski and we were like, “Wow this thing rides really nice.” It has this liveliness that the plastic topsheet didn’t have—it makes for livelier ski while also adding some stiffness. The skis can be what you want but they are in general slightly lighter weight than the industry stuff. Why do everything this way? What’s the point? Our original intention was to build skis that lasted a long time. We use a layer of Kevlar in the skis to protect from rock damage. The maple sidewalls we use are longer lasting than plastic. The goal originally was to make stuff that lasts for charging hard at the village for those 100-day seasons. The industry skis have come a long way but people are still going through two or three skis a season. We are offering a more durable product. Do you have a lot of demand? It’s been growing steadily but it’s still small enough where I get to know each customer personally and ideally I get to go skiing with them. People will come to Jackson to visit and they will come for a factory tour and then they call us up three years later when they need skis. It’s all word-of-mouth. We don’t do any advertising and there are no logos on any of the skis or snowboards. I like keeping it at the level where I get my hands on every pair and I get to know everyone. I’m not saying I do 100 percent of the work, but I do a lot of it. I have been approached by people who tell me I need to step it up and make 1,000 pairs a year but the minute I do that then I have to hire 10 people and I turn into a manager and a salesman. I don’t want that. With a background in robotics, I have often thought about ways to automate the process. But I had a revelation that I really enjoy working with my hands and making the skis. To just meet with someone for 30 minutes and plug their specs into a computer and have other guys on the shop floor making them and shipping them out; that takes away from the whole deal. Any goals for the business? No number goals or anything. I’d like to continue to grow steadily, but not too much. If we became too overwhelmed with orders we would lose the innovation aspect of it all. And I want to keep doing experiments. That is important to me. It’s always been somewhat of a break-even business; I can pay the bills and go skiing. 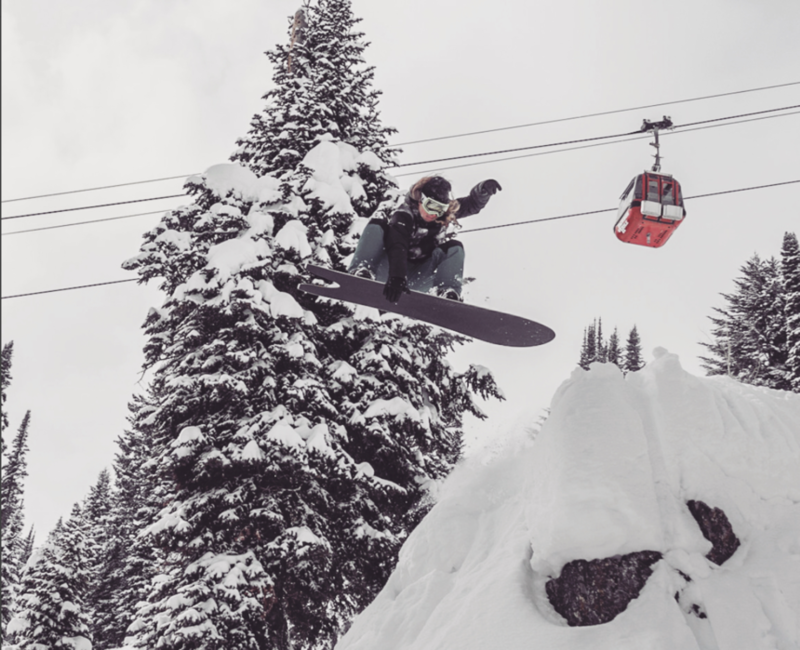 It doesn't hurt to have a playground like Jackson Hole in your background when testing out new shapes. Igneous photo. But it has always been difficult to have employees and be able to pay them. I’d like to see this continue to grow slowly and maybe get some of these people who have been helping out, helping out on a more regular, full-time basis. What changes have you seen in the ski industry since you started making skis? When we started 20 years ago there were no new ski companies. Skis were made in giant Austrian factories, not by kids in their garages in Wyoming. Well, turns out that kids in garages all over the country are making skis now. I guess it’s a parallel to microbrews. Twenty years ago it was all Budweiser and Coors. Now just in Jackson we have 12 breweries between here and Idaho. The beer costs twice as much but it’s worth it. How do you plan to stay relevant among all the little independent brands out there? I could view all these other brands as competition but I don’t. I don’t want to take over or put anyone out of business. One of the things I’ve done through the years is host “build your own skis” classes. A guy named Pete Wagner came through and built some skis here 10 years ago in one of those classes and then went on to start Wagner Custom Skis. We do that because we tried to tour the K2 factory in the ‘90s so we could learn and they were like, “No way it’s top secret.” For us, we have always been open-source with our methods and technology with the hopes that by doing so we will see changes. We are not going to compete with the big companies, and we don’t want to. But if we can influence them to start making some variety of shapes and make skiing more fun for people that would be great.